I write a lot about brokenness in the world. It’s true. I see it, experience it, it breaks my heart, so I write about it. But sometimes the brokenness starts right here at home. The morning started off okay. When I woke up, Cooter was leaning over me, breathing in my face, whispering, “Breakfast. Breakfast.” I got up and put on my everyday jeans (which I planned on changing later when we headed out) and a t-shirt. I threw a jacket over it to take Miss Sophie out for her morning constitutional. I got Cooter his breakfast and then when our Princess got up, she had hers and we started our school day. I should have known better when Princess started with Grammar instead of Math. Always. Start. With. Math. Get that Goliath out of the way first with her. Just the opposite with Cooter. Phonics/reading first. He was excited this morning because he moved to a new book and level, so we got through it fairly easily. After Cooter finished I made the hot chocolate they wanted. From Scratch. I only tell you this so you are prepared to fully appreciate my heartbreak. I was sitting down to call about some business type stuff for my oldest when I heard an “Oh no!” and a splatter. I jumped up. Even though I didn’t want to. Can I get credit for that? Because what I did after deserves no credit. I sent them and the puppy (it was hot CHOCOLATE after all) away to another room. I mumbled and ranted and fussed to myself as I wiped up the mess and tried to treat the fabric seat that was now soaked (really wanting those all wood chairs NOW). I bemoaned the fact that my steam mop is NOT working right now. I sprayed with something to clean and wiped again. And again. And again. I washed down the table and set about making another cup for Cooter, because of course it was his whole mug that was gone. They had made a mistake, and I want them to know I forgive mistakes. I don’t know if the lesson was a good one or not, but there it was. And now we are out of milk. After making the phone calls necessary to clarify the business “stuff,” I got an e-mail that it had been resolved. Basically what I had figured had happened and had tried for two days to explain to the powers that be (who had not listened at all and had dismissed what I was saying)–yeah, that’s what the email confirmed. That I was right. Only it was phrased as this is what we found…..Ahhh. Yes. And in what was definitely not my finest moment, I attempted to forward it to my oldest with a sarcastic comment something like “What I figured. But NO ONE would listen to me. Such is life. Get used to it.” And then proceeded to hit Reply rather than Forward. My own frustrations and attitude came crashing back on me. Here I was contributing to the brokenness and the hurt in the world. I immediately wrote again, asking for forgiveness and apologizing for my rudeness and sarcasm. She gave me grace I didn’t deserve and laughed it off, which went a long way towards me changing my attitude about the whole situation. But y’all. What a hard lesson. I should have known better. THINK BEFORE I SPEAK. OR WRITE. Or apparently even think. *sigh* I was pretty shaken up over seeing my own MESS so close up and personal. I didn’t like it at all. Since that fiasco, I attempted to bake a cake for a friend with a birthday, but I only had four eggs and my pound cake calls for six. I made do, but I was thinking back to Monday Tara, who decided NOT to go to the grocery store and telling her I sure hope she enjoyed her day at home. I sure hope she did. And now we are out of eggs. In the midst of heating up leftover lasagna for her lunch, our Princess spilled half the serving on the floor. Another mess, more tears. More frustration. We are out of lasagna leftovers. This was our day. In a single picture. One broken mess after another. Forget the dishes in this sink. 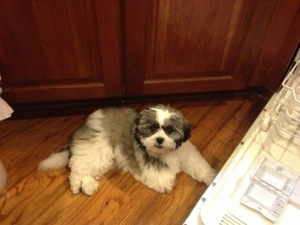 And just close up that dishwasher. Miss Sophie was onto something I think. Bed sounded really good by 2 p.m. today. At one point, Sophie even kindly suggested by blocking the sink that I just give up trying to clean up anything (including the dishes) and go back to bed. Our own version of Peach Shortcake. Brought smiles and healing in the midst of our messy day. So how do you fix all of these messes and heartbreak and brokenness? 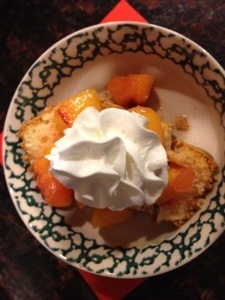 I decided that I don’t want all of that bad stuff to be how the littles remember this day, so I sliced each of them a piece of the pound cake, got some of the Elberta peaches out of the freezer and added whipped cream on top. Princess said it was the best ever, and Cooter couldn’t talk for shoveling it all in his mouth so fast. Both were smiling and all of the messes from before forgotten. Thankful for that. But me? I let myself get bogged down in all of it. I kept on my everyday jeans because no way were we going anywhere after all of this. I had nothing left in me. Everything emotional seemed to steam roll after that. I was sad because my lousy faucet drips unless you turn it just so. And it wobbles. I am not happy with it. Or the person who keeps using cups that can’t be loaded in the dishwasher. I was worried about why Princess kept dropping things today–was something wrong? Anxiety Girl showed up in full force. Stop the madness. And sadness. I wanted to call someone and cry on their shoulder. But no one wants to hear all of this whining. 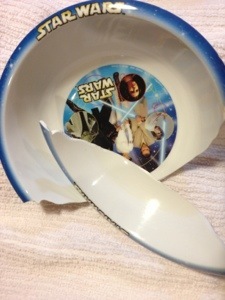 And there’s that whole no crying over spilt milk thing. Kudos to you if you’ve stuck it out this long listening to my “woes,” my first world problems. I didn’t have anyone to call because really, none of this was very serious and the only person who HAD to love me anyway and who ever listened to me whine and then could, in her own way, call me on it or make me laugh about it, is gone. This is what grief does best. Waits until your emotional immune system is low. And strikes with a vengeance. I miss my Mama. It just is what it is. Why she listened to my whining as much as she did, I have no idea. She certainly didn’t put up with it when I was younger. I was so tired and out of ideas that I wanted to text the Fella and say “We are SO going out to eat tonight, k?” But all I could think about is how it is getting dark earlier, and I don’t want to be out after dark. I’m weird like that. Dark=being home. And I thought about ordering pizza from our favorite small town pizza place, but then I started stressing about how much cheese I feed my family, and how we should probably not have that tonight. *sigh* Am I the only one who stresses over my family’s nutritional needs like this? So it’s time to get off my pity pot. Sister called and laughed with me over the e-mail and shared her own horror story of a similar vein. Fella came home and took over correcting Cooter when he crossed the road against our wishes. Sophie is looking at me with those eyes like she KNOWS and she gets it. Princess has bounced back to her sunshiney self, and Cooter hugged me twice. Without me asking. Aub problem-solved for herself about something that needed doing. Not too shabby. So the piles on the desk didn’t get attacked today. The dishwasher was full and dirty while supper was still in the oven. (Yes, we actually had a meal despite the lack of staple groceries.) I got the laundry somewhat caught up but nothing folded. I didn’t get to the grocery store yet again. So it goes. My Mama would say, “Well at least nobody’s shooting bullets at us.” Or “If this is the worst that ever happens to us, we’ll be okay.” And I reckon she was right. Still, if tomorrow rolls around and Future Tara decides to finally go to the grocery store, I won’t complain. And if Mess Cat calls about us getting together and having supper tomorrow night, I’m all for it. (hint hint) I will welcome a life lesson from a goose or a bird or even a spider, at this point. Just please, please, no one spill anything. Because, yeah, that’s one more thing. We’re almost out of paper towels. Oh, girl, nothing goes better with whine than a phone call to ME! 🙂 But I totally get it… unconditional listening… that’s just one of the things she did best. Sorry for your hard day (but thanks for keeping it real). Be gentle with yourselves, grief is hard work. Thanks for the grace Dena. I appreciate that. And thanks for reading and sharing. I am laughing about it all now, it was just so hard in the moment. Isn’t it the craziest thing what can get us bogged down, what can trigger the waves of grief? I’ve said it before, grief is an odd duck. Love to you. I connected to your blog via my friend, Ashley G.I don’t read every day, but have enjoyed lots of your posts. This may be my favorite. We all have days like that. Aren’t you glad we aren’t perfect? Or…maybe we are, and it’s our idea of what perfect is that is off. We have a wonderful friend in common, and I am glad to know you! Thank you for reading and for saying hello. I am glad we aren’t all perfect, but even more, I love your thought that maybe our idea of perfect is what is off. Yes ma’am, that might just be the thing. So glad you liked this one. Today I am laughing about it all. In the moment, well, you know, it was VERY real. Hope to visit with you again soon. Best wishes!